Endovenous laser ablation goes under several proprietary names e.g. EVLT, ELVes, VeinSeal, depending on the manufacturer of the laser. 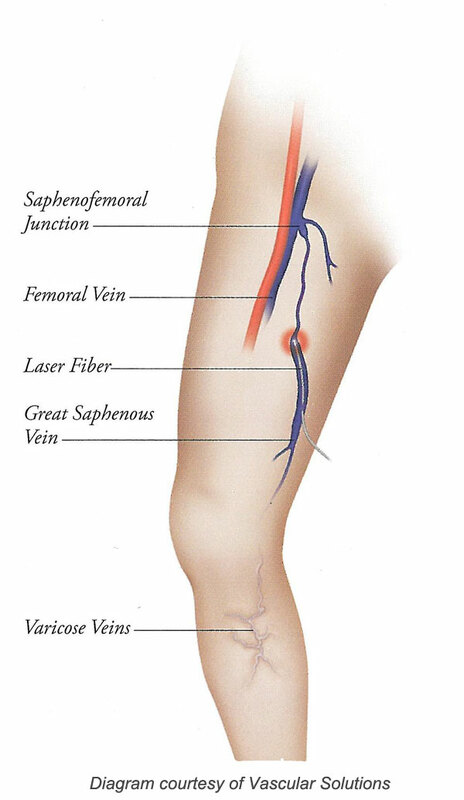 We use the general term EVLA for Endovenous Laser Ablation, as all the various types of laser ablation are essentially the same. EVLA is a new method of treating varicose veins without surgery. Instead of tying and removing the abnormal veins, they are heated by a laser. The heat kills the walls of the veins and the body then naturally absorbs the dead tissue and the abnormal veins are destroyed. It can be carried out in a simple treatment room rather than an operating theatre. EVLA is performed under local anaesthetic as a Walk-in, walk-out' technique. During the 45-minutes procedure, a laser catheter is inserted into the defective vein. This is usually performed under local anesthesia using ultrasound guidance. The laser heats the lining within the vein, damaging it and causing it to shrink, and seal shut. Once this happens, the closed vein can no longer carry blood, eliminating vein bulging by correcting the root of the problem. Because these veins are superficial, they are not necessary for the transfer of oxygen-depleted blood back to the heart. This function will be naturally diverted to the healthy veins. 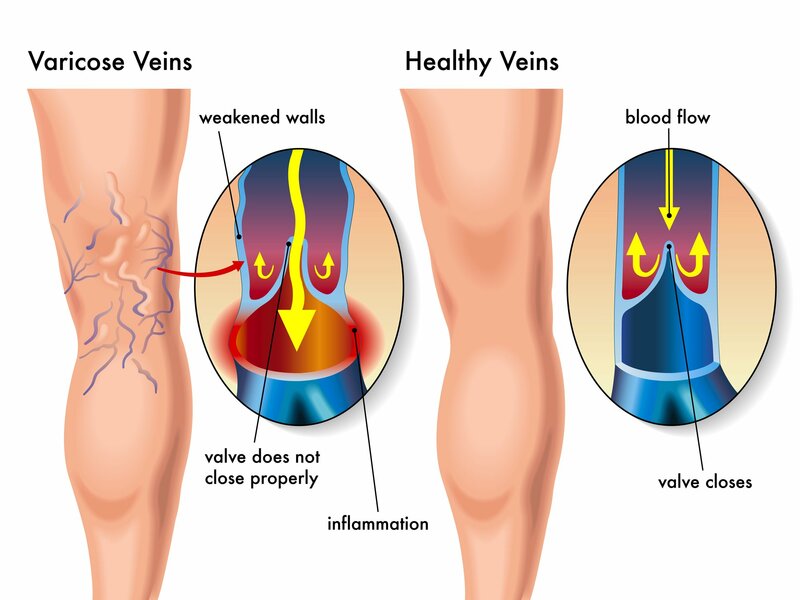 In fact, because a varicose vein by definition is damaged, it can actually be detrimental to your overall circulatory health. Although not life threatening, it should be addressed before further complications develop. 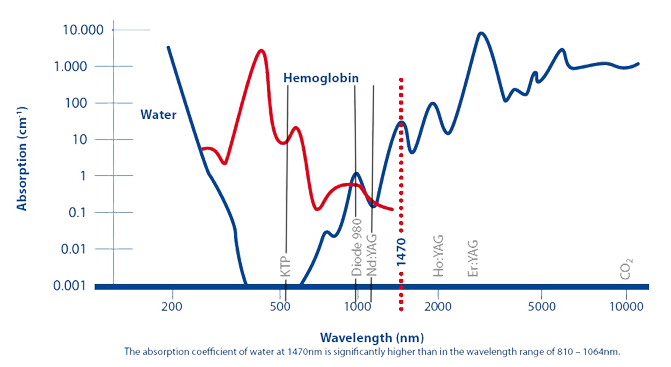 The 1470nm laser energy is preferentially absorbed in the intracellular water of the vein wall and in the water content of blood. The irreversible photo-thermal process induced by the laser energy results in a complete occlusion of the treated vein. The lower energy level needed using the radial laser fiber significantly minimized adverse effects compared with the bare laser fiber.